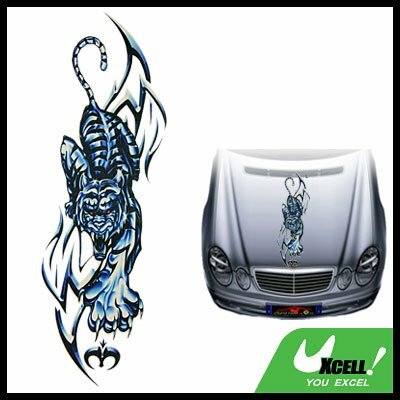 * This Car Body Graphics Decor is designed with a vivd aweful tiger pattern inlaying it. * The Car Sticker can be applied on any smooth surface including auto windows, plastics, books, walls, metal, etc. * Water and weather resistant, will not fade or peel. * Attaches smoothly with self-adhering surface, leaving no residue when removed. * Clean the car surface before sticking the Car Decal Sticker on your car. * The Car Decal Sticker is also great for home and office ornament. * Also perfect for decoration..
* Dimension: 43.3cm long, 14.2cm wide. Approx. * Colour: As picture shows.